Thank you! Very nice to read! Beautiful and love the picture. This is something I aspire to. Wow. Incredible. This photo was taken on the street. Inspiration came unexpectedly, after watching the Christmas catalogs. My sister and I went in search of a makeup artist. I wanted to make an unusual festive makeup. It was nearing evening. And at the last moment the makeup artist couldn't make it. We got to the location already by 16 o'clock. Just the two of us with the brush and a few cosmetics. I used a white reflector and a warm winter afternoon sun. I used a Canon 6D along with a 50mm 1,4. I have not used this lens. I was glad to take it again in hand. I was looking through the profile in instagram, Russian blogger and makeup artist Elena Krygina. 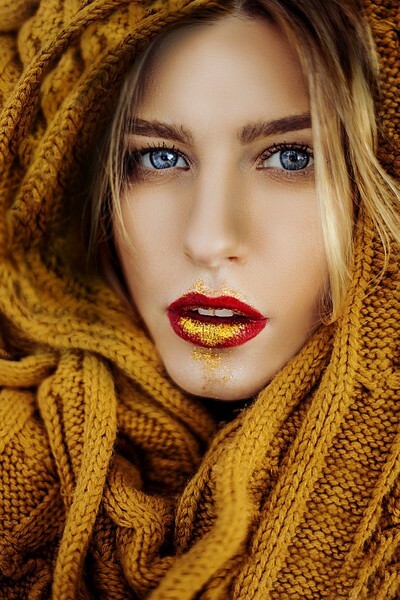 I was impressed with the new trend of glitter on the lips. Of course, we wanted to repeat with something similar make-up. But I had to field conditions and the cold to come up with makeup most of the available tools. Don't be afraid to take pictures. Even if you don't have all of the funds that were planned. Most importantly - inspiration. Everything else - it turns out by itself. Go for it!